I demonstrated weaving at the Minnesota State Fair this year, a Friday evening at the Weavers Guild loom in the Creative Activities Building. The air was late-summer stuffy and the traffic was light, but I had many fun conversations with people who were interested in what was unfolding in front of me. Near the end of my shift, as I chatted with a man about his weaving, I noticed a small girl and her father watching attentively from the bench outside the loom area. “Do you want to come up and try?” I asked her. She could beat, I thought, even though she might not be able to put the shuttle through so well. She amazed me. Within four shots she figured out how you need to pay attention to the edge after putting in a shot, and that I was moving pedals under the loom. She squiggled down to reach the pedal; that didn’t work so well. She was only three, but she was intent. She wove for several minutes by my side, and would surely have stayed if it wasn’t almost 9pm and loudspeaker announcements were urging visitors to leave. I brought a beautiful set of fabric strips to use in my weaving that night, but FORGOT THE RAG SHUTTLE. Instead, I used the one shuttle by the loom, and used the rug warp as weft. The result was so UN-beautiful. I resonated with the instructions that we get before the fair, which stress that you shouldn’t try to make something perfect, because you will be interrupted many times and your first priority is to talk with people. My length of weaving was a perfect example. You can see that my beating changes a bit throughout, resulting is some areas that are a bit more packed than others. My thought was that I would make a nice runner with graphic blocks of color and some alternative directions of twill lines. But it was ugly! 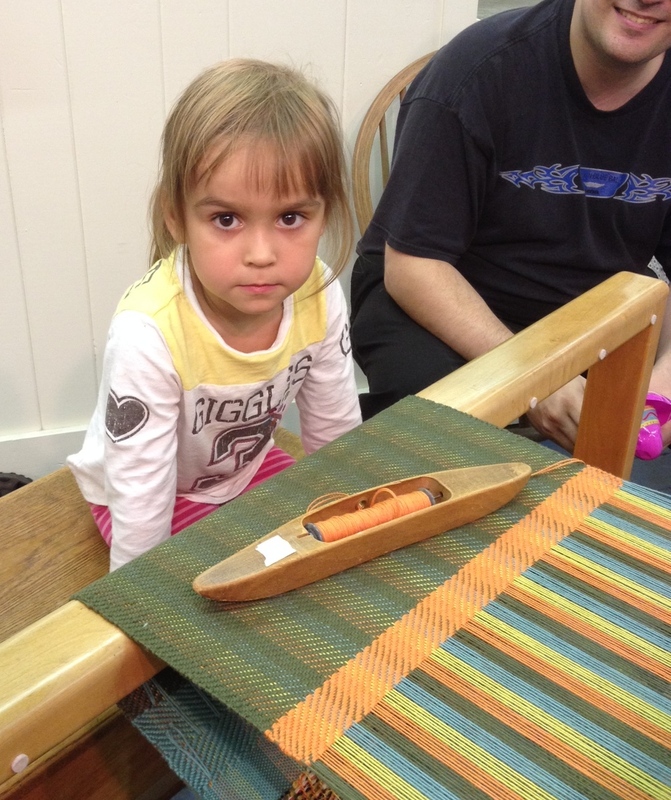 Oh well, as we know – perfect weaving wasn’t the goal of the night. 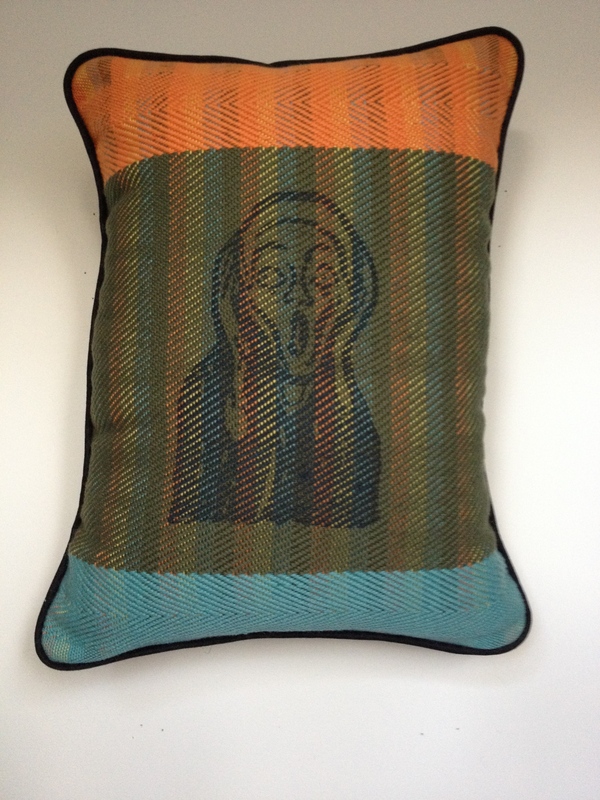 But since I hate to completely abandon hand-woven cloth, I used it. Here’s the result. You aren’t surprised by another Scream, are you? Looks good to me, Robbie.